Decorating your home, whether for year-round enjoyment or for a festive holiday display, is an inviting way to welcome friends and family. Decorate your doors, inside and out, with freshly cut or purchased dry grapevine garlands from craft stores. Hang grapevines around the frame of the door for a simple, natural setting. Use the grapevines alone, or add a variety of embellishments to suit your home’s style and your taste. Make your home stand out from the rest with this simple decorating technique. Measure the perimeter of the door, around the outside of the frame. Cut the grapevine into lengths to fit the door frame. A standard single door will need about 14 feet and a double door will need about 18 feet of grapevine. 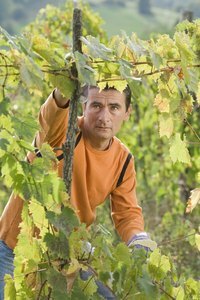 If you have shorter lengths of grapevine, overlap and bundle lengths together and tie with twine to obtain the correct length. Attach cup hooks or utility hooks to the top corners and top center of the door frame. Screw cup hooks into the wood frame above the door, making sure that the hook opens to the top. Attach two or three additional hooks along each of the two sides of the door frame, with the hooks opening to the sides. This will allow you to catch the grapevine in the hook without twisting it. Use fewer hooks if the grapevine will not be exposed to wind. Soak dry grapevines until they are flexible. Freshly cut grapevines may not need soaking. Wrap a set of mini lights around the grapevine, if desired. Allow enough of the plug end to be free of the vine to reach an electrical outlet. Wrap the lights in a barber-pole style around the grapevine, spacing them evenly along the entire length. Find the center of your full length of grapevine garland and tie a piece of twine tightly around the bundle, making a small loop with the twine. Hang either the grapevine itself or the loop of twine over the center cup hook. Be sure the end with the electric plug is on the side of the door where there is access to an outlet. Wrap a length of twine around the bundled grapevine at each hook location and make a loop at the end of the twine. Attach each loop of twine to the hooks at the top corners and along the sides to secure the grapevine. Add berry picks, artificial flowers or ornaments to the garland by tying onto the grapevine with small pieces of floral wire or twine. Use removable adhesive utility hooks on the inside to avoid holes caused by cup hooks. Using twine to tie and hook the grapevine, rather than hooking the vine itself onto the hooks, will help prevent the vine from ripping down in wind. If adding flowers to an outdoor display, be sure the products are meant for use outdoors. The dyes in many artificial flowers and berries will run when exposed to rain or snow and can damage your door and surfaces of your home. Hang lighted grapevines for year-round decoration, then add seasonal and holiday embellishments throughout the year. Use spring flowers and birds, fall leaves and gourds and holiday ornaments to bring your decor into each season. Do not hang the grapevine on the hooks by securing the electric light cord to the hooks. The weight of the vine supported by the cord can damage the cord and cause a fire. Wrap the bundle and cord inside the twine for safety.